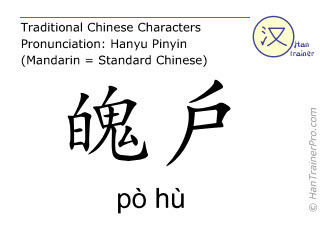 You cannot listen to the pronunciation of po hu because your browser does not support the audio element. *Please note that these are simplified (not traditional) characters. Clicking on one of these characters will take you to the "normal" Han Trainer Dictionary for Chinese Language. With our digital learning cards for Chinese, you can also learn Mandarin with your mobile phone.